Some of you long time readers may remember my rant a few months ago about the harrowing, hair-raising, teeth-gnashing, nail-biting experience we had with buying a house in Southern California. With all the talk of a real estate depression we thought buying a nice house would be a piece of cake. Instead the two month ordeal with trying to buy a short sale caused me to lose ten pounds and got me written up for my sour mood at work. Ultimately we didn't get the house. Then a miraculous event happened. An even better property came on the market a couple of weeks later, just two blocks away from our lost house. And this time we got it, after minimal fuss and no more hair or weight loss. In fact I've gained back those ten pounds and then some. Notice I said "property", not house. The lost house was a newer and bigger house. But our new house is on the "better" side of the neighborhood and has a much bigger lot. It is the oldest and cheapest house in the best part of the neighborhood. So now we have a remodeling project to attend to, which I was not anticipating when we set out to buy real estate. But a nice thing about remodeling is that we get to upgrade the house with the latest equipment, from kitchen appliances to light fixtures, to, get ready, a NEW HOME THEATER SYSTEM. I'm so psyched. 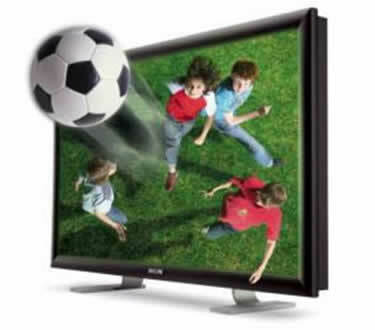 With the success of Avatar, there is a whole slew of new TV's with 3D capability coming on the market. While I normally don't buy first generation electronic equipment (I waited until the 3GS before buying my evil iPhone and I won't even touch an iPad until maybe the third generation if ever), the timing is such that equipping my new home theater with a 3D TV makes sense. Why buy a new TV when it might be outdated as soon as next year if it doesn't have 3D? I read through all the reviews of the models already on the market. There's all this video jargon about ghosting and cross talk and other geek terms that made my eyes glaze over. Then I traipsed to Best Buy to take a look for myself. They had several models set up for 3D viewing. The actual content available to watch in 3D was pretty minimal. They had several 3D animated movies to watch, like Monsters vs. Aliens and Cloudy With A Chance Of Meatballs. A Samsung model could convert any 2D programming into 3D on the fly so we watched some World Cup soccer in 3D. That was kind of cool except the image appeared slightly distorted because of the artifical 3D created by computer. The first set I tried was a Pioneer plasma. The 3D glasses were nice looking. They fit surprisingly well over my regular glasses. They also felt extremely light. I don't know how my ears and nose would hold up after watching Avatar for 3 1/2 hours with two glasses on my face though. The 3D screen was, um, interesting when you first put on the glasses. It definitely is 3D. Images do seem to pop out of the screen. The picture also stayed 3D even when not standing directly in front of the TV, something that some reviewers had criticized about. But after a few minutes I could feel my eyes getting tired. This was concerning. I certainly don't want to spend this much money on a TV feature that causes eye strain. So I moved on to the Samsung LCD. The glasses were not as attractive but they were equally light and fitting. The depth of the image didn't seem as impressive as the plasma. Maybe it was because I saw the plasma first that gave me that important first impression. But I also noticed that my eyes didn't hurt after watching the Samsung. It felt very natural. Perhaps something about the LCD vs. plasma? Also the Samsung has the 2D to 3D conversion, something the Pioneer doesn't. But when you turn on the 3D feature, the image becomes unwatchable for anyone without the glasses. The TV screen shows overlapping split images in 3D mode. Everyone in the room will have to wear the glasses to watch TV or everybody splits up to their own rooms to watch their own programming. They didn't have the Sony set up yet for 3D so that's something I'll have to go back and try later on. We're still in the middle of our remodeling so I don't have to decide just yet. Maybe I'll wait until Christmas to read more reviews as people gain experience with these new sets and see if the price drops a little bit. Perhaps more companies will come out with 3D TVs and I'll have more choices. Right now it's a wonderful problem to have. I love my new house, my new neighborhood, and being a lucky member of the ROAD professions. Any suggestions about what you would do in this next situation? I'm interviewing my next patient for outpatient surgery. While discussing her previous surgical history, she says that she had a similar procedure done last year and her insurance wouldn't pay for the anesthesia. So my billing office had been sending her letters requesting reimbursement for the anesthesia provided. The patient says we had coded the case erroneously and we should have upcoded the case to a more complex procedure so the insurance company would reimburse for anesthesia services. She claimed she had been going back and forth with the office about why she refused to pay. I explained to her that the procedure today is similar to that prior one. The anesthesia coding would probably be the same. It would be a crime for us to change the procedure code just so we would get reimbursed from insurance. She said if that was the case she is highly unlikely to pay for anesthesia services if the insurance company won't pay. So now what do you think? Should I have cancelled the case and risk the ire and wrath of the surgeon and the surgery center because of MONEY? Or would it be reasonable to proceed? Who is the greater fool, the patient for not paying money for services rendered, or me for proceeding with a case knowing that there is a high risk I won't get paid for it? Should we all just become employees of the federal government and ObamaCare and forget about all this billing thing? A report from JAMA says that hyperoxia during cardiac resuscitation can actually be detrimental to the patient's health. 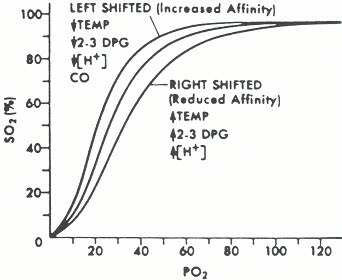 Patients whose blood gases came back with a pO2 of greater than 300 mm Hg were found to have an 80% greater chance of dying compared to patients with normal oxygen tension. I recently came back from an ACLS recertification course. During the course they said the new recommendations are that patients should not have their chest compressions interrupted for the ten seconds it takes to intubate and protect the airway. 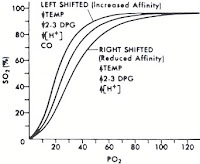 Also the patients should be bagged at a rate of no more than 8-10 breaths per second as hypocarbia can worsen tissue hypoxia, as demonstrated with the oxyhemoglobin dissociation curve. Well great. That means anesthesiologists no longer have to go running to every Code Blue in the hospital to emergently intubate. The American Heart Association says intubations only delay the resuscitation algorithm. Intubations usually lead to hypocarbia worsening tissue hypoxia. And now hyperoxia leads to greater mortality. Call me after you get the patient's pulse back. Sorry U.S. Soccer. Your second consecutive loss to Ghana in The World Cup has deflated the whole notion of America embracing soccer as the next great sport. I'll see you in four years, assuming you qualify for the next World Cup. 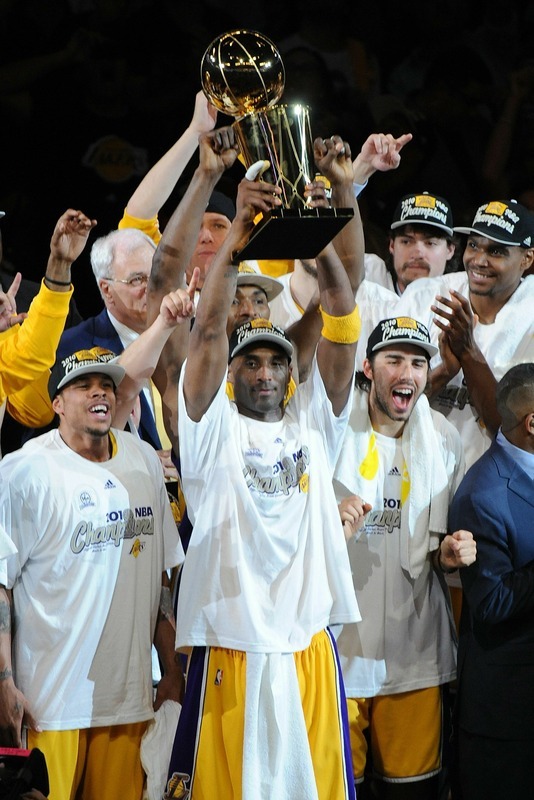 Now it's back to the great American sports traditions. Baseball's All Star game is just around the corner and the NFL preseason is less than two months away. Are you ready for some (American) football?!!! The one year anniversary of Michael Jackson's death is upon us. With his death came the worst kind of notoriety for our favorite anesthetic propofol. Previously, patients had no clue what kind of anesthetic they were receiving. All they knew was that they did not wake up until the surgical procedure was finished and that was fine with them. Now when they ask about their anesthetic, the word "propofol" elicits a universal "Oh, the Michael Jackson drug." I've even had patients tell me they refuse to get propofol because of MJ's death. Only after carefully explaining the negligent role of Dr. Conrad Murray do they understand that there is nothing wrong with the drug, just the administration of it by an incompetent physician. The following twelve months did not improve propofol's reputation. In July 2009, the FDA forced TEVA to recall 57,000 vials of propofol. At least forty people were sickened by a batch of bacterially contaminated drug. Two lots of drugs were found to contain bacterial endotoxin. Luckily despite some fevers and chills nobody died despite their sepsis. Then in March 2010 Hospira was forced to recall several lots of propofol when tiny particles of stainless steel from their manufacturing vats were found in some specimen. There were no reports of embolic injuries to patients with this finding. Finally in the greatest bombshell of propofol's horrific year, a jury in Las Vegas last month awarded a couple $500 million when the husband contracted hepatitis C after receiving propofol at an endoscopy center. Dozens of patients were contaminated when the medical staff used a single bottle of propofol on multiple cases. The jury ruled that Teva and Baxter were at fault for selling the center extra large vials of propofol, thus tempting the staff to use them on multiple patients to save money, despite the fact the bottles clearly state they are for single use only. The pharmaceutical companies vowed to appeal but the week after the ruling, Teva decided to pull out of the propofol market completely. So what will the next year bring for propofol? Is the end nigh? Now that Teva has withdrawn from the market there are only two manufacturers left, and one of them is European. The continued fear of lawsuits against this low margin generic drug may eventually force these last two companies to also drop their propofol production. Then where will we stand? There is still the old standby pentathol. Maybe our pharmacy can dig up a few dusty boxes of them in the back of their cabinets. Versed and demerol is still widely used by gastroenterologists everywhere who refuse to use the services of an anesthesiologists. Then there is the promise of fospropofol, the water soluble successor to propofol. It is a precursor drug that is metabolized into propofol in the body. There is less risk of bacterial contamination because it is not preserved in a lipid medium. It produces less discomfort with injection. However because it is a precursor drug its affects maybe slightly more difficult to titrate than propofol. Since it is a new drug it is also much more expensive. Fospropofol is classified by the FDA as a controlled substance, similar to narcotics. So the ease of reaching into the anesthesia cart's drug drawer to grab a bottle of propofol will be a distant memory for anesthesiologists. The next year may prove to be quite consequential to our dear old friend. Now start working on your threepeat! Have you ever wondered about the humanity of your fellow citizens that share the road with you? 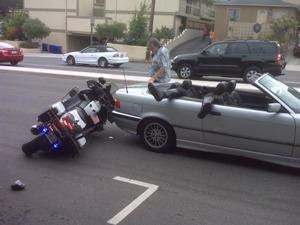 The above picture was taken by a passerby shortly after an accident in Hermosa Beach, CA when a police officer rear ended the BMW convertible. You can see the officer's legs sticking out the back seat and the driver inspecting the back of his car. Not only does the driver seem to care more about the condition of his car than the health of the human being sprawled across his back seat, but the suspect, Brian Hitchcock, wrote some pretty inflammatory statements to the local newspaper. First of all, Mr. Hitchcock denies being the driver of the car but he seems to know the driver really well. Says Mr. Hitchcock, "The driver of the car, with 41 years experience, appeared stunned by the sudden intrusion of the officer landing behind him. It is not known whether he was injured by the flying officer." Mr. Hitchcock goes on to defend the driver in the accident as some sort of hero, "The driver of the car may have been scared out of his wits when officer Parente fired up his siren at point-blank range. Nevertheless, the driver's quick response allowed him to keep the car safely in its own lane, which avoided involving other motorists in the accident." He also kindly points out that the rear driver in a back end collision is usually the one at fault under California law. There is no inquiry by Mr. Hitchcock on the well being of the police officer or any signs of sympathy toward his injuries. Police have noted that during a routine police stop a driver usually slows down and pulls to the right side of the road. It is evident in the picture that the car was still in the middle of the road lane when the accident happened. The police department is investigating if the officer was riding too close to the vehicle when he collided, or whether the BMW driver deliberately stopped suddenly to cause the collision. Luckily the police officer only suffered soft tissue injuries and is recuperating at home. Q. How politically impotent are physicians in this country? A. When the most socialist president in recent history has to stand up for us to convince the Senate Republicans, our traditional allies, to prevent the 21% Medicare paycut that has already gone into effect June 1. In President Obama's weekly radio address, he urged the senators to reverse the Medicare cuts and work toward a permanent solution to the insane SGR annual "adjustments" that have frozen physician reimbursements for the last 20 years despite ever rising expenses to treat patients. But Obama didn't give this speech because he suddenly felt a personal bond between doctors and the Executive Branch. He realized that if these cuts go through more doctors will opt out of Medicare itself, making medical access even more difficult for seniors. With ObamaCare vowing to bring millions more patients into doctors' offices paying Medicare rates, he knows his program will be a failure if people wake up and understand this whole program is a sham, using wealth distribution that restricts medical access for all. As for our so called "friends" in Congress, the Republican leadership decided that they would draw a line in the sand on further deficit spending right at the doctor's doorstep. After trillions of dollars spent in the last couple of years for banks, brokerages, insurance companies, Fannie Mae, Freddie Mac, auto companies and their unions, home builders, used care dealers, appliances makers, profligate student loan borrowers, long term unemployed, two hot wars in the Middle East, and countless other federal programs, our Congressional allies finally found a constituency they felt they could ignore without fear of losing at the ballot box. Yes cutting the salaries of doctors would make absolutely no difference to them in their ability to get reelected. And that's the definition of political impotence. I saw this storefront at the local strip mall. I find it quite amusing, if slightly appalling. The sign says "Specializing in raw food diet for cats and dogs". 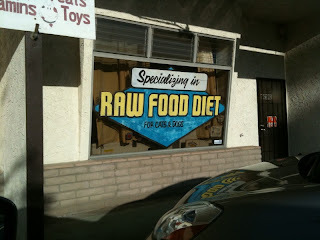 I didn't know raw food for pets needed its own specialty store. I thought a raw food diet was whatever they find in the alleys and garbage cans. It disturbs me that we have millions of people who go hungry in this country and around the world yet some people will spend money on pampering their pooch with a special raw food diet. And don't get me started on pet food that advertise themselves as containing real meat and no fillers. These pets eat better than many children in our urban or rural areas. Is it any wonder people feel the gap between the poor and the wealthy in America is unbridgeable? They figuratively don't live in the same country at all. In a follow up to the Abby Sunderland story, the 16 year old girl who was attempting to sail solo around the world before her boat floundered in the Indian Ocean was found alive and well by a search and rescue team. The firestorm surrounding the parents' decision to let a minor child do this has not abated. 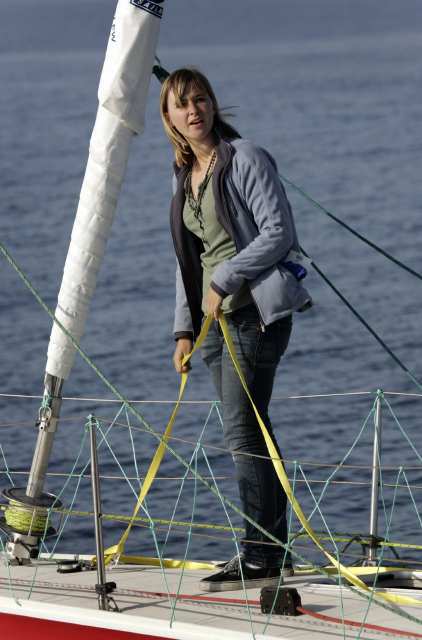 Her father has compared the risks of sailing solo for 13 months to the risks teens face when they drive. Not many teenagers die sailing in remote oceans while thousands die every year behind the wheel. I guess he has a point. The above image is representative of what's commonly called "railroad tracks". 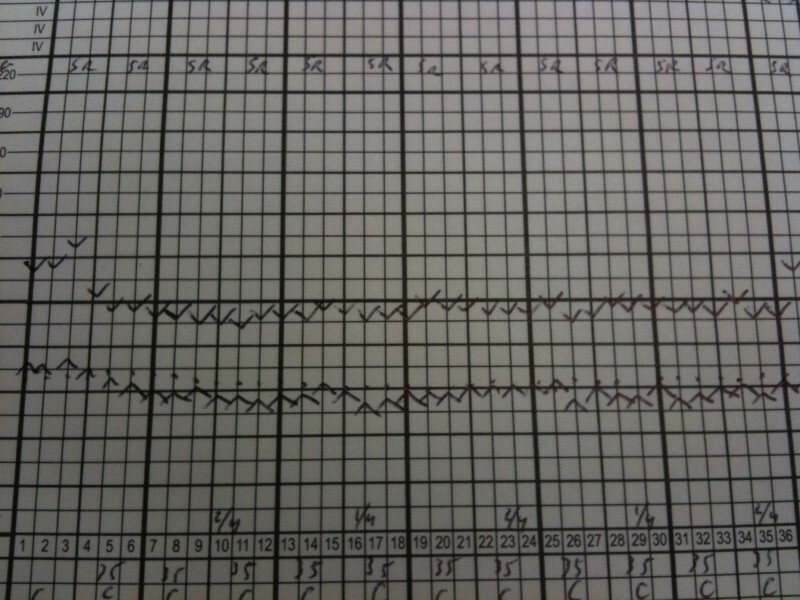 It is an anesthesia record where the vital signs are perfectly stable and unvarying during the case. Vital signs like these are considered ideal as it shows the anesthesiologist was maintaining the patient's physiologic state despite the surgeon's attempt at causing great harm and pain to the body. 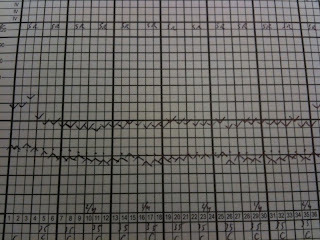 Rarely do patient's vital signs stay this even, no matter the interventions of the anesthesiologist. When a surgeon makes an incision, the blood pressure and heart rate rise due to activation of the sympathetic nervous system, not because the patient is "awake" or "light". During the operation any large amount of sudden bleeding may cause the BP to fall. Manipulation of internal organs can make the vital signs flutter erratically. So achieving railroad tracks on an anesthesia record is pretty uncommon. Except that I've noticed ever since residency that some anesthesiologists fudge a little on their records. I've seen records of cases where the patient could become extremely unstable, such as an aortic aneurysm repair or cardiac bypass and the vital signs hardly deviate despite major physiologic changes during the case. I used to think that, wow, this anesthesiologist must be excellent. Then someone told me that records like this are another form of defensive medicine. If there are any problems with the patient later on, such as an MI or stroke, the anesthesiologist can point to his record and say that there were no problems during the case; any perioperative complication must have occurred outside the OR, shifting the blame to the surgical staff. If an anesthesiologist has to give deposition for a malpractice case, he can point to his record and tell the lawyer that the patient was perfectly fine while under his care. Thus the anesthesiologist will try to extricate himself from any suit. The beauty of this is that only the anesthesiologist is recording the vital signs in the operating room. Everybody else is too busy with their assigned tasks to pay much attention to what's on the screen. The anesthesiologist's recording is the last word on the patient's health during a case. There is no audit system present. Perhaps the advent of electronic record keeping in the OR will change all that. Once it becomes wide spread it will be interesting to compare the electronic vs. manually recorded anesthesia records and see who really is an excellent anesthesiologist. I saw this in my patient's H+P. When presented with the option of anesthesia or no anesthesia, he risked insanity and agreed to anesthesia. No problemo. French scientists have trained dogs to detect prostate cancer in the urine of patients. They trained the dogs to sniff the urine of patients with healthy prostates and known prostate cancer. Then they had the dogs do blind smelling tests of urine. The dogs apparently became pretty good at it. Out of 66 tests, the dogs were correct 63 times. As many urologists will tell you, the PSA test that is the standard for detecting prostate cancer is not as accurate as we are led to believe. The next step is to understand the chemical that the dog is smelling to automate the process. Otherwise every urologist's office will need to keep a dog on site to smell patients' urines. As an aside, this story reminds me of the episode in The X-Files where Scully discovered she had brain cancer when a monster targeted her for his next meal. Again, life imitates art. I saw this license plate at the local superstore. This being Los Angeles, is the driver professing a fondness for man's best friend, or something a little more carnal? Ha ha.